Love the look of a green, healthy lawn, but don't have the time, patience or skill it takes to let one grow? Struggling to get a good result from your grass, and need a fix that lasts for years and looks fantastic? If you want to add a lawn to your commercial premises or improve the gardens at your public building, call the landscaping specialists at Ricky Tyler Landscapes today. With over 13 years of experience, our qualified garden design team have been serving Hertfordshire and the UK since 2002. We've undertaken projects of all sizes and kinds, from renovating public parks to creating playgrounds and managing retail forecourts. No task is too big - or too small - for our landscapers, and we pride ourselves on delivering the right result on time and on budget. If you're looking to add turf to your garden, we're the team to call. Alongside our commercial turfing services, we can also create seeded lawns from scratch. Using high quality grass strains, the very best in topsoils and our own cultivation knowledge, we'll establish and tend to your lawn and get it looking fantastic. Seeded lawns give a longer-lasting, more natural looking result and can withstand far greater wear and tear - ideal for sports pitches, playgrounds and garden areas with high footfall. Once your new lawn is in place, you'll want to make sure it stays looking fantastic. We're also available for garden maintenance when you need it, including weed management, lawn mowing, border strimming and tree stump removal. Whatever the task, you can be sure of a great looking lawn, year after year. 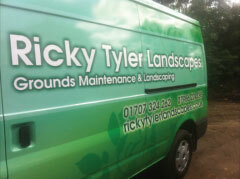 Arrange your on-site consultation today or get advice from our specialists: call Ricky Tyler Landscapes today. 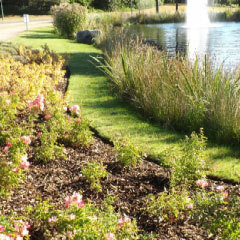 Ricky Tyler Landscapes can provide gardening and grounds maintenance services including Turfing covering London, Essex, Hertfordshire, Northampton, Buckinginghamshire & Bedfordshire .